Does this tree have a will to live? A drive to survive is common to all living things from viruses on up, as I see it anyway. In somewhat higher forms of life, we see this as the survival instinct. This survival instinct must be regarded as a fundamental emotional drive in any animal we think of as having emotion, although I suppose there are those who believe only humans have emotion, but no matter. This will-to-live emotion is most apparent when an animal is cornered, and must dig deep within itself to overcome obstacles to survive. 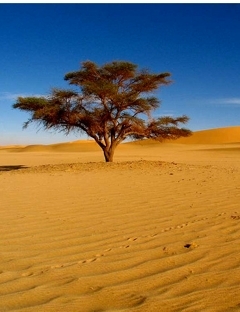 This Saharan Desert tree is clearly striving to survive. Does it experience a will-to-live? Do plants have emotion or instinct? The answer to this lies in the eye of the beholder, or in accordance with some biological definition agreed upon by the ‘powers the be’. In something like a virus, which is even harder to imagine as having emotion, I still see a will-to-live, pure and mysterious though it may be. 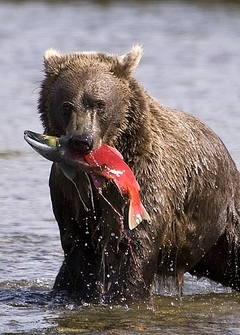 Do bears have a will-to-live? I just realized that in we thinking animals, the will-to-live emotion influences thought and quite naturally leaves us with the impression that we have free-will. Up to this point, I’ve thought of ‘free will’ as a belief, either implied or explicit mostly. It is that, but runs considerably deeper than I imagined. It works better to think of the free-will sensation as an emergent property of thought and the core emotions of need and fear. If nothing else, an imagining mind offers the beholder a neurological space where sensation is free to roam. We can imagine any scenario we fancy, unconstrained by actual realities. For example, I can imagine having wings and flying without harm. On the other hand, a drug induced hallucination that feels so real I jump off a cliff to fly is otherwise; gravity bring me down to earth, back to reality. Sure, our free-will hallucination is more subtle, but perhaps just as dangerous. We are free to imagine alternative time-lines, which influence will at every turn. This sensation enables us to expect the impossible to be possible, to beat ourselves up in guilt-ridden illusions of Self-perfection. This imaginary ‘free will zone’ combines with our primal will-to-live and imparts a sense of free-will even if we know free-will is a fiction! It is truly insidious, and ironically, probably increases with ‘intelligence’ if we lack the wisdom to see through this bio-hoodwink. i.e., Homo sapiens, ( Latin: “wise man”). 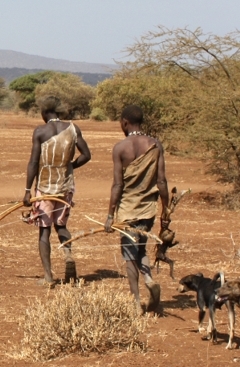 Yes, ‘sapiens’ is more of an evolutionary goal than a current reality. I am in awe. I am humbled. I am determined to be more vigilant. No, not through free will, but because I recognize the spontaneity-robbing misdirection this hallucination causes. The waterfall analogy is so helpful. I woke up this morning at odds with myself, not happy with my behaviors, just feeling bad. I am sure millions of people everywhere are feeling the same way and for some reason that’s a comfort. My thoughts about this feeling are foam, not solid, really nothing but a mist. But the foam is enough to catch me up and spin me around. No matter. I better return to the waterfall. I just had a fleeting realization. The feelings that come from thinking too much, comparing, judging, are always f**ked up feelings. No, there is something deeper. I think it is fear. Fear causes those comparing and judging thoughts. Oh darn. Not again. Getting back to survival instinct! The reason you struggle is that you are trying to understand it through thought. That is impossible. The knowing arises from below thought, bubbles up into thought, and voilà the understand ‘enlightens’. The point is that you have no choice. You will “strive on diligently” as best you can no matter what you think. Your natural base is so much more than your ‘idea’. The mind is like the tip of the iceberg. The bulk (body & emotion) lie below the surface. In some respects, when it tilts left, the mind ‘thinks’ right; when it tilts right, the mind ‘thinks’ left. Man only is without knowing, and because of this I don’t know. Because of this, the sacred person wears coarse cloth and cherishes pure. In desiring to inhale through the nose, one must first open up. In desiring a little less, one must first make an effort. In desiring to take, one must first give. This saying is little understood. So … why try? Why should I “…strive on diligently” …it seems that you are suggesting that any thinking, any cognitive processing is all foam anyway? Uhg. I’m tired and jet lagged. Maybe if I stop thinking about this for a bit it will help. I’d like to both hug you and punch you right now … I wonder which one of those is visceral, and which is foam?!? Seriously … I appreciate the feedback and the education. I think you’re right on that score. “Discipline” is a myth (like ‘responsibility’) associated with free will, and wishful thinking. You will only exercise when you viscerally feel the necessity to do so -> the will to do so. This feeling may, or may not, result in a cognitive experience (i.e., “I’m going to exercise”). The ideal / desire / dream to do so will not generate sufficient true will to do so. In our species, thoughts arise from the currents of emotion like so much foam. The dream of Self dominates our awareness like the foam that covers the surface of the roaring water beneath. This is but the tip of the iceberg of consciousness, yet it is all we can put our cognitive finger on, i.e., really believe. The emotion from which thought arises is ‘nameless’. Whenever belief is displaced by a visceral animal emotional certainty, then hypocrisy is replaced by straight forward ‘wild’ honesty. This is the ‘magic’ we all admire in others when we think they have it, and what we all yearn for our own lives. The difficulty we experience comes from wanting more than nature has given us, and from being unwilling to give our life to what nature has given us. The grass is greener instinct being able to run a muck in imagination. In other words, we have a conflict of interest; imagination always promises us more than we are willing to pay time and energy for. Oh my, so many words to say what is so simple. I suppose this is like solving a multidimensional puzzle in a one dimension. Anyway Mike, keep at it… strive on diligently. Thanks Carl. I read the post. I want to drink. Sooooooooo …. influencing my moment to moment life. I see this on a few levels. First, I get that it doesn’t matter, because of the whole rat-in-the-maze thing. Lemme walk through this “out loud” if I may …. The get in shape thing …if I apply this recent lesson, I guess the influence is that perhaps I don’t start exercising. I now realize that my impetus to do so in the first place may have been thinking I should, vs. being “naturally” driven to. I may then make the choice to be more disciplined, because the realization that I don’t have the natural drive (at least enough to offset the drive to sleep late) is contrary to my health … so I force myself to work out. Of course, this could all be part of the big hoodwink, as perhaps “nature” “intended” me to act via thinking rather than internal drive (or maybe for some cosmic reason Nature wanted me to act based on the thought vs. the drive. Yes, except perhaps when you say “my actions will be driven by my essential being”. Actions are driven by gut felt need (or fear), the same that occurs in any animal. All thoughts about decisions, actions, constructs, explanations, understandings, etc., are the fabric of imagination. I wouldn’t necessary say we use them “to explain or understand” ourselves or others. The neurological activity of imagination by (my) definition also be the result of need or fear. Of what particular need or fear one’s imagination activity is symptomatic can vary greatly: empathy, ‘fight or flight’, blame, curiosity, comfort, safety, fairness are some of the main instinctive drivers that I see. You seem to be getting closer to seeing the ‘big picture’. The ongoing challenge will be seeing how well it influences your moment to moment life. Take a look at this old post: To Drink, A Horse Must Want To Drink. Lately I’ve become determined to get myself in better shape. My actions (or lack thereof) have nothing to do with my “free will” decision to exercise or not … I either will or I won’t, but any decision to do that is illusory … my actions will be driven by my essential being and the decisions are constructs that I use to explain or understand myself. Please don’t explode another portion of my brain …I don’t have much left ….